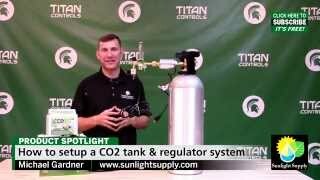 Learn how to set up a CO2 tank & regulator system. Regularly rotate your CO2 tanks through an AUTHORIZED CO2 tank refiller. This will insure that the tank has been properly inspected and thoroughly tested for safety. Cracked tanks and broken valves can be dangerous due to the high pressure that is in the tank. When servicing the CO2 Regulator, make sure the pressure gauge on the regulator has completely depressurized before unscrewing the large outer clear plastic tube from the CO2 regulator. My CO2 Regulator is icing up. How do I fix this? You can do a few things to fix this problem. First, make sure that your CO2 tank is in an area that is 60° + . Second, reduce the flow coming out of the regulator to about half, then increase timing pattern to compensate for reduced gas flow into your grow area. Finally, we make a CO2 Heater (Item # 702715) that warms the CO2 stream as it comes out of the tank and avoids freezing your CO2 Regulator. Where should I set my flow rate? We recommend that you set your flow rate at 10 SFCH (Standard Cubic Feet per Hour). This flow level accommodates most gardens. Adjust as necessary for your specific plant requirements. How accurate is the pressure gauge on the CO2 Regulator? The CO2 Regulator has an accuracy level of +/- 2.5%. How many Amps/Watts does the CO2 Regulator draw when in operation? The CO2 regulator draws .04 amps - 4.2 watts when in operation. What are the washers for that come attached to the CO2 Regulator? The washers are to be placed between the output of the CO2 tank and the input of the CO2 Regulator to avoid gas leaks from the connection. If you don't have any washers, they may be found at most welding or gas appliance retail stores. You may also purchase spare ones from your local Hydro Dealer, just ask for item number: 702712. How do I know if my CO2 Regulator is leaking? The easiest way is to attach your CO2 Regulator to the tank and open the tank nozzle to allow gas to flow into CO2 Regulator. DO NOT plug the 120 V Solenoid cord set into power source. Now, using a spray bottle with mild soap solution, spray all connections on the CO2 Regulator. If you see bubbles form, this is where the CO2 is leaking from. Tighten up any connections to seal the CO2 Regulator or call our Technical Service line for more assistance. How do I know how full my CO2 tank is? CO2 tanks are filled by weight. Your 20 lb. tank has a tare weight on it (stamped into top of CO2 tank), so the Vendor puts it on a scale and subtracts the tare weight, then fills it with 20 pounds of CO2 liquid. For a 50 lb. tank, they would fill it with 50 pounds of CO2 liquid minus the CO2 tank tare weight. If you want to know how much gas you have left in your CO2 tank, just put it on a scale, subtract the tare weight of the tank and this will give you your CO2 gas weight left in the tank. For instance, if you have a 20 lb. tank with 10 pounds left in it, you have half a tank left. 5 pounds left, quarter tank, etc. My CO2 Regulator dial always reads LOW. Even after I just fill it. Why is this? This is normally due to having your CO2 tank in a cold location. The pressure in the tank is constant after filling and has nothing to do with the liquid in the tank. The CO2 pressure is reduced in cold areas below 65° F. The pressure is what is released from the liquid in the tank and should be constant throughout the application of the CO2 gas. The normal remedy to this problem is to put your tank in an area that is above 65° F . You should see the pressure needle rise and be in the Green area of your CO2 Regulator dial. What is the pre-set operating pressure of the CO2 Regulator? The pre-set operating pressure of the CO2 Regulator is 0 - 3BAR. What is the safety pressure release setting level? The safety pressure release setting is approximately 6BAR. What is the tolerance band for the CO2 Regulator? The tolerance band is +/-2.5%.